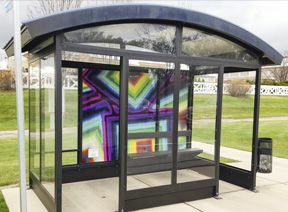 In late 2015, the Geneva Cultural Arts Commission sought to beautify their suburb and encourage the arts at Geneva High School by selecting the senior projects of two art students for display at Pace bus shelters within their community. Pace is a suburban bus transportation system. No small job, the student paintings would have to be reproduced in seven-foot by 10-foot sizes and applied to the back portions of the shelters. Because the bus stops are in the county right of way, permits needed to be submitted to the local division of transportation for approval. Several businesses were considered for the project, however Image360 was selected for the work for three reasons. They were experienced in obtaining municipal permits, capable of reproducing graphics in large sizes on vinyl, and experts with subsequent wrap installations. Having gained the confidence of the arts commission as well as their contract, the local full-service resource went to work recreating the student paintings on thin vinyl of the type used to wrap cars and trucks with promotional graphics. 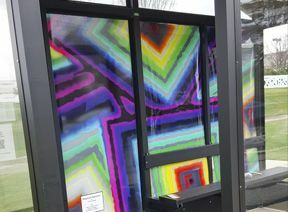 Taking into account the artwork’s exposure to the elements, Image360 recommended a cast vinyl overlaminate to protect the vibrant colors from weathering and fade-inducing ultraviolet light, as well as the wear that might be expected at a public bus stop. From concept to completion, Image360 required but three days to permit, produce and put up the two works of art. That said, no shortcuts were considered. The signage, graphics and display center ensured accurate reproduction by selecting high-performance vinyl, printing on color-calibrated wide-format printers, and conducting rigorous quality checks. 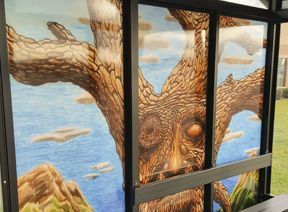 With the two bus stops now “branded” in a manner unique to Geneva, the talents of the city’s high school’s artists – and the expertise of Image360 – are eliciting encores. No fewer than a dozen more Pace bus shelters in the city are slated to gain student works of art for 2016! If you’re looking for great examples of branded wayfinding, we’d say that Image360’s bus stops are a great place to start!